Thank you. I was wondering about that. I agree that some of the variations of that saying are getting out of hand. I saw a pink poster the other day. It said "keep calm and think like a princess"
My sister in law bought a changing mat for my niece that says 'Keep Calm and Change my Bum*. I'm not sure if that's more or less horrible than 'Think like a Princess'. She's mentioned buying us a baby bath, I hope she doesn't get us a changing mat as well. In the south one's nanny changes the nappies on one's offspring. Almost two and a half years between posts? Where/how have you been? How lovely to be remembered (: I've been somewhat awful and mostly well, doing the life thing, you know. You? I'm decidedly impressed with everyone's know how in Isrealish. Are you familiar with the proverb 'we'll kill a Turk and rest,' the Hebrew equivalent of 'one step at a time'? what is origin of " keep calm and......" i have come across so many variations of that phrase on everything from keychains to posters to door mats. It was the slogan of a British government poster of 1939, intended to convince the British people that Germany wouldn't be conducting air raids on British targets. But in fact, the posters were never widely distributed, and seem never to have been put on display on public billboards. So the wider world would never have heard of it[...]. According to this website it's from 1938. Part of "Dig for Victory"? I'm pretty sure that didn't come about 'til the actual start of the war. 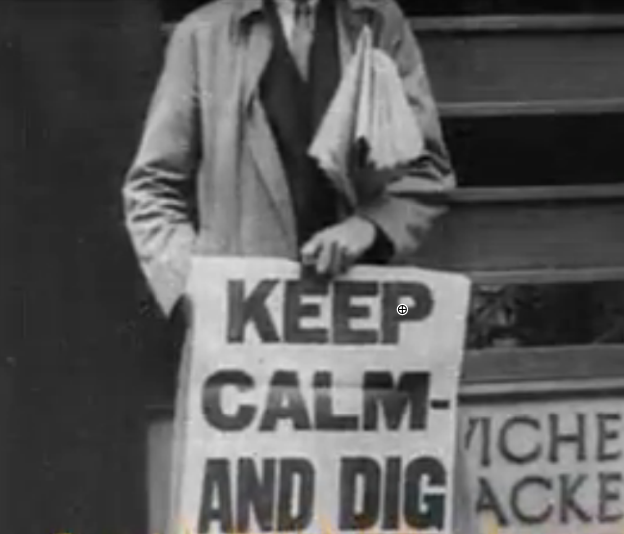 As to the KEEP CALM AND DIG of 1938, the trenches for protection of civilians started in 1938. I remember reading of it but when I tried to get info, despite typing WW2, I was constantly directed to trench warfare of WW1. Finally, I found a site called St John's Wood memories that mentioned the digging of the trenches in Regent's Park - for 6000 and Primrose Hill for another 2000. I had read it in a book maybe a decade ago? but could not get any info about civilian used trenches pre start of WW2 until I typed in Trenches in Regents Park. If I hadnt typed that,- which was a bit vague, as a memory, I don't know how long I would have been directed and redirected to WW1, which may explain why it isn't so well known. This is the bit I managed to lift from the original. I am computer illiterate and struggled with this. If you visit the site, it has some photos and drawings etc of bomb shelters but this WAS done well before the war, as unease grew. 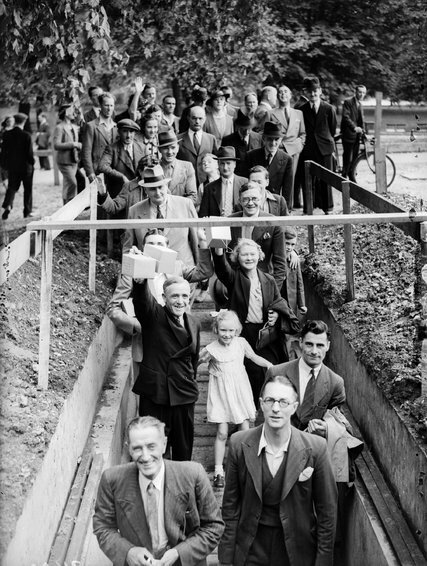 The need to provide shelter for citizens caught in the open when an air raid started was realised before the start of the Second World War, so in 1938 trenches were dug in Regent’s Park that had room for 6,000 people and in Primrose Hill for 2000. Unfortunately, they were usually very damp. The Zoo, (which closed on the outbreak of war but reopened within a month, and stayed open throughout the war), had shelter for 1,000 people. "Oh bloody 'ell, 'ere we go again!" 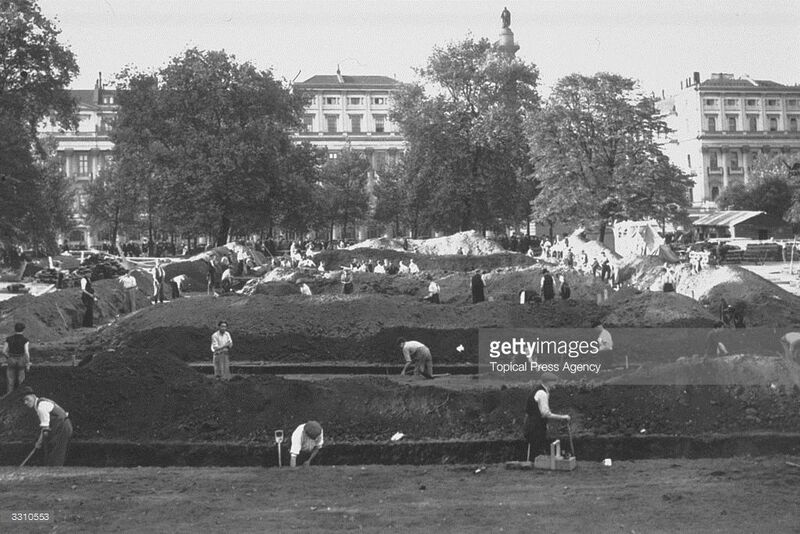 I am sure I read that a lot of people were very peeved about the Regents Park trenches, when new, on grounds of inconvenience and mess and I believe they were were very muddy, and sometimes up to a foot of water in the bottom and a source of great scorn for some time.